30% off entire term of deployment with deployment paper required! Move in for $1 when you prepay for your second month! 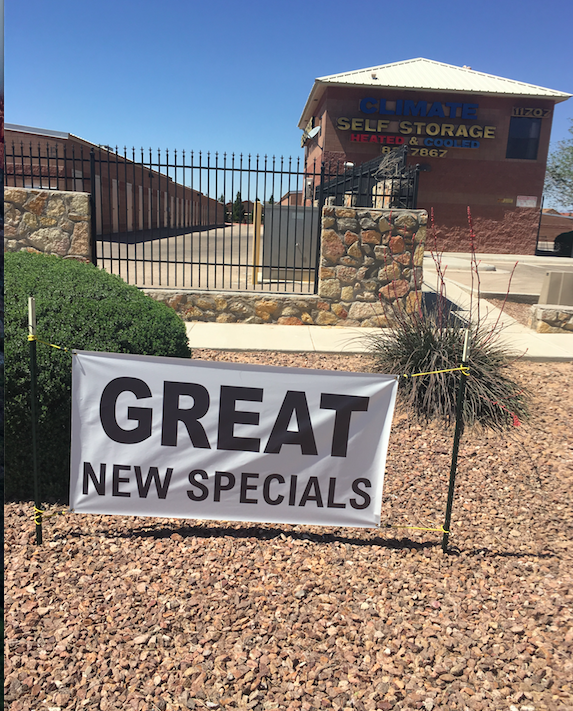 If you live in northeast El Paso, TX metro area, you're sure to find the storage options you need for your next storage project at Climate Self Storage. Our facility is situated at 11707 Dyer St just off US-54 and near the New Mexico border. We're just a short drive from Chaparral, NM and in proximity to Homestead Meadows South. Come visit us and let us show you what we have to offer! If you're looking for a high-quality storage facility to store your belongings that has all those extras that make the entire process hassle free, Climate Self Storage is the place for you! Our facility offers climate control, drive-up access, and high-tech security features at highly competitive prices. We offer online bill payment to make keeping up with your rent as easy as can be. In fact, we think you'll be surprised with how easy storage with us will be! Many of our customers take advantage of our great RV and boat storage options. This isn't your run of the mill parking lot, either! Although we do have basic RV and boat parking, we offer covered parking options as well to protect your vehicle from the elements. Pair that with customer service that is second to none, and you’ve found the perfect storage facility to meet your needs. Come visit us and let us solve your storage problem!